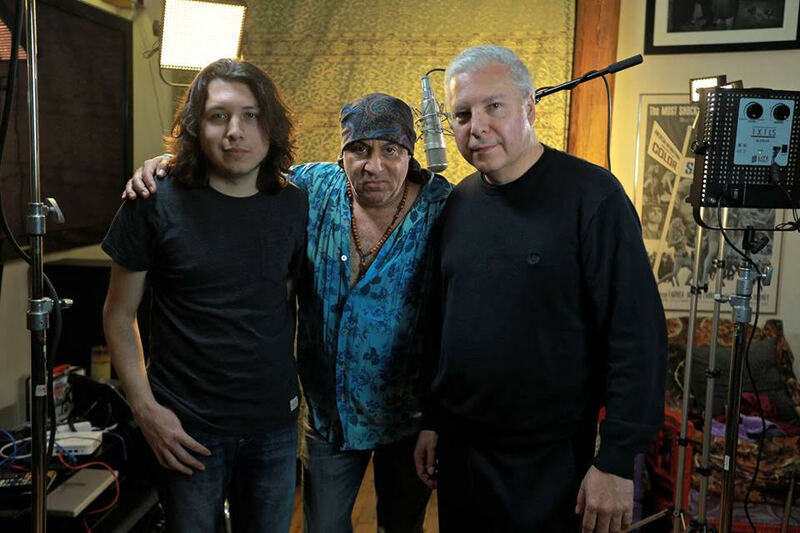 Production Assistant Ryan Johnson, Steven Van Zandt, and Executive Producer Tim Johnson during the making of RUMBLE: The Indians Who Rocked The World. I’m sure that Native Americans cringe at no end of things when they watch the way their people are depicted in old Hollywood westerns, even the few that set out to illustrate the crimes that have been committed against them by the American government. But the cliché that must surely set their teeth on edge is the standard music used to represent them. You know the tune I mean: that monotonous 4/4 thudding with nonsense syllables droned over it. Even if you already understand that the music of the indigenous people of this continent is more variegated than that, you’re likely to be surprised at how much of a factor it has been in shaping our popular music, from blues and jazz through rock and roll and up to hip-hop. That’s the thesis of Rumble: The Indians that Rocked the World, the documentary that will be screening this Thursday evening at the Burchfield Penney Art Center. Produced by the same team that examined Hollywood clichés about Native Americans in the documentary Reel Injun, Rumble makes the case that much of the blues, the basis of most American popular music, was heavily influenced by Native music due to high rates of intermarriage among the two groups. Ethnomusical analysis aside, Rumble focuses on important musical figures whose Native heritage figured in their art. The title of course comes from the 1958 instrumental by Link Wray, probably the single most influential two and one-half minutes of guitar music outside of the Chuck Berry catalogue. Others profiled include Delta blues icon Charley Patton, big band singer Mildred Bailey, Jimi Hendrix, Jesse Ed Davis, Buffy Sainte-Marie, Robbie Robertson, Redbone, and Ozzy Osbourne’s drummer Randy Castillo. The impressive roster of talking heads testifying to the importance of these folk includes Tony Bennett, George Clinton, Buddy Guy, Quincy Jones, Jim Keltner, Wayne Kramer, Taj Mahal, Iggy Pop, Martin Scorsese, Slash, Derek Trucks, Steven Tyler and Steven Van Zandt.